This is the place they call "Hollywood." It's where I work, eat, and sleep. Sometimes I even get to play a little, but usually only when I solve a case for a grateful client who pays his bill promptly. See, I'm a private eye—the guy folks call when they run out of easy solutions to the messes they've gotten themselves into. Being April First, I was hoping the sizeable check a client just handed me was not an April Fools' Day prank. I'm sure my creditors were fervently hoping the same thing. Conveniently, the check was drawn on the First National Bank Hollywood branch, which just happens to be in the same building as my office. Even more conveniently, the bank manager is a pal. Once upon a time he found himself in the unenviable position of needing the sort of help in which I specialize. I solved the problem for him and did so discreetly, which means he still has his job. For that reason he is slightly more lenient with me in financial matters than he might otherwise be. In this instance, however, there was no need for leniency. The check was good as gold. An hour later I was at my desk licking the back of a postage stamp intended for the last of six envelopes I was sure would make the landlord and five other creditors happy, if not downright gleeful. 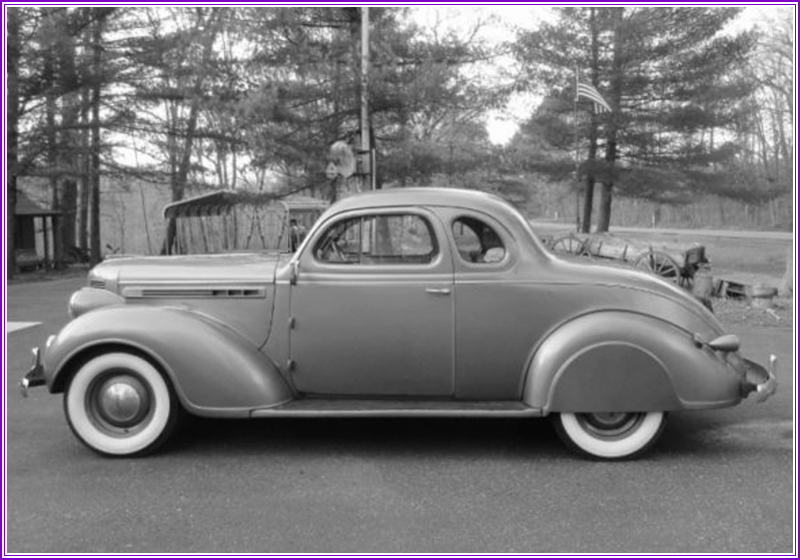 Being thus solvent again, I climbed behind the wheel of my two-year-old Chrysler Royal Business Coupe and stared through the windshield. I was planning to take the afternoon off to celebrate having two nickels to rub together again, but now, with a full tank of gasoline and the engine running, I had no idea where to do my celebrating or with whom to do it. The possibilities occurring to me just were not striking my fancy. Hollywood is lousy with bars and lounges, but I didn't feel like spending the afternoon drinking in a joint with acquaintances and nary a true friend in sight. When I gave the subject more thought, I decided the sort of celebration I needed was to get above the world for a different perspective, and I knew just where to do that. I pushed the transmission lever into first gear and pointed the Chrysler's dandy streamlined hood mascot in the direction of Mulholland Drive. For those who are not up on LA geography, Mulholland Drive winds along the ridge of the Santa Monica Mountains from Hollywood to Malibu. Those particular mountains separate Los Angeles from the San Fernando Valley to the north, and for my purpose of getting above it all, Mulholland is the perfect road. It offers terrific views of LA and the Valley. What makes Mulholland even more perfect for getting away from it all is that it is away from it all. The Santa Monica Mountains are pretty rough and desolate. Nobody lives up there, at least not until you get near Malibu and the ocean. I've driven the seven or eight miles of Mulholland from Hollywood all the way to Sepulveda Boulevard without encountering another living soul. Because of its desolation mystery writers with overactive imaginations like to murder folks up on Mulholland Drive. Phooey on that. It's not that you couldn't kill someone up there, but why traipse clear out into the hinterlands when you can much more easily sneak out at night and toss the body off the Malibu Pier? Of course, the rich folks with beach houses in Malibu aren't too thrilled when decomposing bodies wash up onto their private beaches. Anyway, I began my celebration playtime cruising along Mulholland in a westerly direction, occasionally pulling off the road to spend a few pleasant moments looking down on the busy little ants of Beverly Hills, Westwood, and Brentwood industriously increasing the size of their fortunes. At Benedict Canyon Drive, I turned south to take a gander from one of my favorite overlooks. To call Benedict Canyon a road is an exaggeration of enormous proportions. 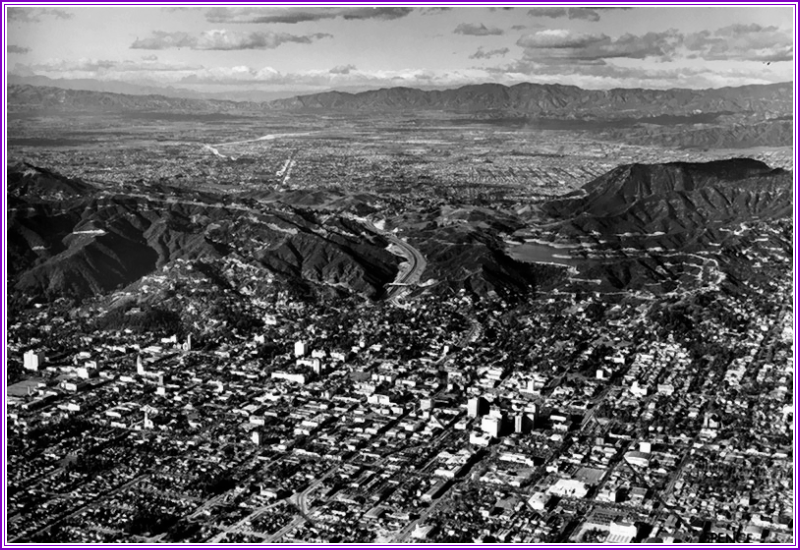 At one time the County of Los Angeles got ambitious and paved parts of Benedict Canyon. Now, though, even those sections are more dirt and gravel than pavement. Throw in a lot of twists and blind curves, along with a steep downhill grade, and you've got a route definitely not intended for timid drivers. The trick to surviving country roads like Benedict Canyon is keeping your speed down so your automobile doesn't get away from you and go careening down the canyon like a pinball bouncing off trees and boulders. I was driving thusly when I rounded a blind curve and my windshield was suddenly filled with a redhead. 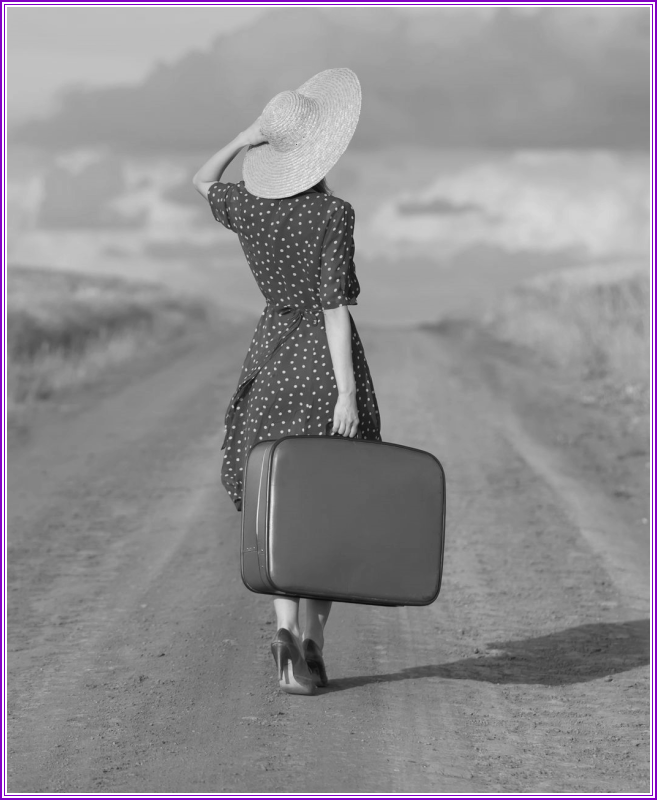 About all I had time to see before I got very busy trying to keep both of us alive was the young woman's red and white polka dot dress and a suitcase. Oh, and did I mention she was a redhead? The woman looked over her shoulder, saw me coming, and deftly stepped aside like a Toreador dodging a charging bull. My Chrysler and I slid right past her. When all the skidding and sliding came to a stop, I jumped down to the ground intent on giving Little Miss Redhead a thorough chewing out. She beat me to it. Standing erectly and looking intensely incensed, she glared at me and said, "Sir, your driving skills are atrocious. You very nearly ran over me!" "Lady, I don't know which planet you fell off of, but people in these parts have more sense than to walk down the middle of a road—a blind road, at that!" She turned the intensity of her glare up to full power. "As if it is any of your business, sir, I come from Denver, Colorado, where automobile drivers are taught that a person afoot always has the right of way on any road." Sensing that arguing with Dumb Dora would get me nowhere, I was about to wish her a pleasant day and get on with my drive when the full realization of the woman's situation finally dawned on me. She was a stranger and clearly not dressed for hiking in the hinterlands. The woman was also carrying a suitcase several miles from the nearest civilization and she was on a road that came from nowhere—a dead-end. All that made me wonder if she could use a little help. Knowing full well I was making a big mistake, I took a deep breath and said, "Look, Miss, I apologize for the close call, but as long as we're here, my name is Johnny Spicer." I offered my hand. She looked at my hand as if it were the last thing in the world she wanted to touch, but her glare dimmed a few kilowatts. "All right, Mister Spicer, I accept your apology, but you really should drive more carefully." As if an afterthought, she added, "My name is Constance Allen." I nodded and lied. "Nice to meet you, Miss Allen. Now, why you are wandering around out here in the boondocks is none of my business, but if you could use a ride somewhere, I'm offering." As if responding to a cue in a script, her head tipped to one side and shot me a don't-try-to-kid-me look. "In exchange for what, Mister Spicer?" This dame was sorely testing my patience. "In exchange for nothing, damn it. I'm offering help if you need help, but you clearly have the situation well under control, so I'll leave you to it." I turned toward my Chrysler and it only took two steps for her to swallow her pride. That surprised me. I figured she would let me get further before saying, "Ah, Mister Spicer, perhaps I could use a little help." I looked back over my shoulder. "Okay. Toss your bag behind the seat and let's go." Miss Allen opened her mouth as if about to chastise me for the lack of chivalry I demonstrated by not carrying her suitcase to the car. She thought better of it, though, and trotted around to the passenger side of the car. When I got the Chrysler turned around and headed back toward Mulholland Drive, I asked the logical next question. "Where would you like to go, Miss Allen?" "I am on my way to Hollywood, if that would not be out of your way." I glanced at her sitting demurely in my passenger seat. I knew I was making another mistake, but I had to ask. "Hollywood? Then what in heaven's name are you doing clear out here?" Answering my question with a question of her own, she said, "Is Hollywood a long way from here? The driver of the taxicab assured me it was just down the hill." I shook my head imagining that conversation. I was pretty sure there was more to the story she wasn't likely to tell me. "Miss Allen, I'm afraid that cabbie was pulling your leg. We are quite some distance from Hollywood." In an apparently unconscious reaction, she pressed her knees together when I said the cabbie was pulling her leg. "Are you certain of that, Mister Spicer?" "Yes, reasonably certain. I live in Hollywood." "Where would you like to go in Hollywood, Miss Allen?" She removed a well-worn piece of paper from her handbag and carefully unfolded it. "The address is 1438 North Gower Street. Do you know where that is?" "Sure, it's smack dab in the middle of poverty row." "Poverty row? I don't understand." "Poverty row is an area of mostly unsuccessful motion picture studios hanging on by a thread. Although, it sounds as if you're heading for the only successful operation in the neighborhood, Columbia." Miss Allen nodded enthusiastically. "Yes, that's right! Columbia Pictures. The one with the torch lady at the start of their movies." I was beginning to get the picture and it was a sad one. Miss Constance Allen was one of the thousands of hopefuls who show up on Hollywood's doorstep every year expecting to become stars. I was about to ask another question or two that would confirm my suspicions about Miss Allen, but kept them to myself. It was a lesson she needed to learn for herself, no matter how painful the education. Most of all, I did not want to get stuck with Miss Allen when she found out she traveled a thousand miles on a wild goose chase. She probably didn't have more than a few dollars in her purse, which could explain why the cabbie dumped her in the boondocks. Remembering her reaction to my comment about him pulling her leg, I suspected he picked her up at Union Station or the bus depot and on the way she probably said something about the meter being so high, which he interpreted as a pretty woman offering to settle her fare in trade. When that proved to be a misunderstanding, he taught her a lesson in taxicab etiquette. We rode in silence until I turned right on Highland. A minute later we were in the heart of Hollywood. Like a good tour guide, I pointed this fact out to her. "Welcome to Hollywood, Miss Allen." She leaned forward and looked out the car windows in all directions. Her expression said she wasn't impressed. "This is Hollywood?" "Yes, ma'am, it surely is." "Are we anywhere near anyplace famous, like the Brown Derby?" I was beginning to feel a little sorry for Miss Allen, so I humored her. "It's not too far. I guess we could swing by for a look." "Oh, thank you! It would be so exciting to see it in person." 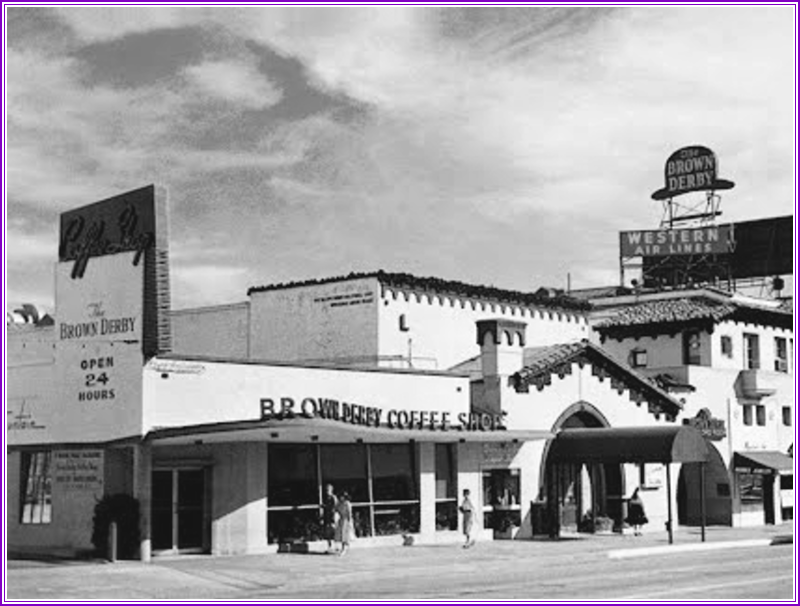 I could not imagine what about seeing the Derby would be so exciting, but I turned left off Highland Avenue onto Hollywood Boulevard in order to include the Brown Derby on our route. Now things were getting a little more interesting to my passenger. 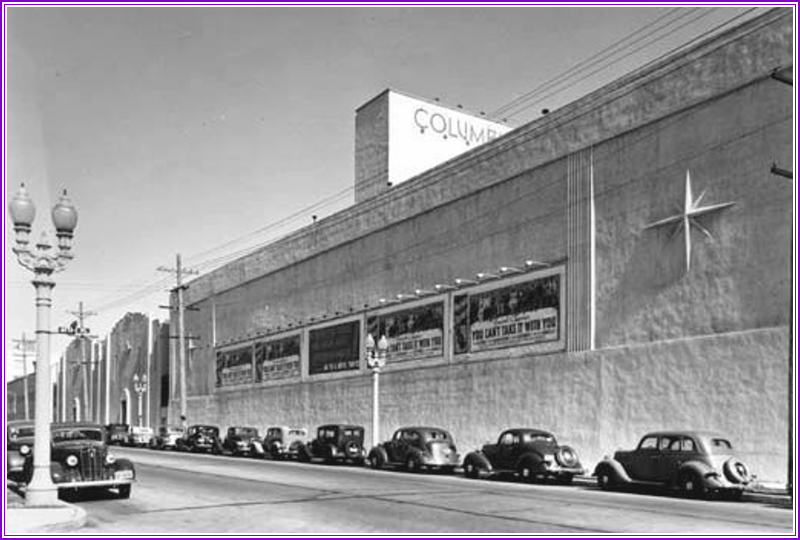 She took notice of the Egyptian Theater a block further along the Boulevard. "Egyptian Theater? I thought it was a Chinese Theater." "Where is the Chinese one?" "In the other direction on this street." A few blocks later I turned right on Vine Street and pointed up the block. "There's your Brown Derby." She looked at the rather nondescript building with a sidewalk awning. Sounding surprised she said, "Oh, no, that's not it. I've seen pictures. The building is shaped like a derby hat." "There are four Brown Derby's, Miss Allen. This is the Hollywood Derby where you're most likely to see motion picture celebrities. 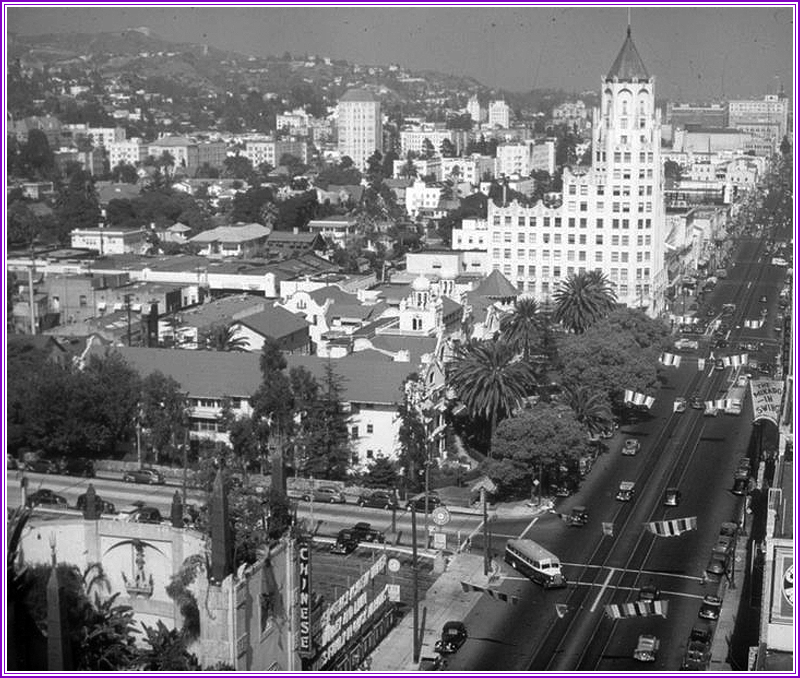 The hat-shaped one is on Wilshire Boulevard in downtown LA." I turned left on Sunset and my disposition improved a few moments later when I turned left again onto Gower. A block after that I pulled to the curb in front of Columbia Pictures. Opening the passenger door for her, I said, "Here you are, Miss Allen, Columbia Pictures. The main gate is over there in the opening between this building and that sound stage—the building with the half-round roof." Miss Allen stepped down from the running board and I removed her suitcase from behind the passenger seat. As I set it down on the sidewalk, she said, "Thank you, Mister Spicer. You have been very kind. Perhaps I will be able to repay your kindness one day." "That's not necessary, Miss Allen. It was my pleasure to be of assistance." She gave me a look that said she was certain nothing could be further from the truth. Knowing I was about to make yet another mistake, I said, "It’s none of my business, but do you have an appointment with anyone at Columbia?" She beamed at me. "Oh, yes. It's not exactly a specific appointment, but Mister James Stewart is expecting me. "On that note she squared her shoulders, picked up her suitcase, and walked confidently toward the studio gate. I shook my head in amazement. Mister James Stewart, or Jimmy Stewart as he was known to his millions of fans, was certainly not expecting her. Hell, Columbia wasn't even his studio. I have no idea what made her think Stewart was on the other side of Columbia's gate anxiously awaiting her arrival, but she was about to get a hell of a let down. Climbing back into the Chrysler, I watched her turn the corner to the studio gate and started the car, intending to drive back to the office. Something kept me from driving away, though. I knew what was going to happen when she tried to get into the studio. If I left, Constance would surely be stranded again. It didn't take long for my prediction to prove correct. No more than five minutes passed before I again saw Constance on the sidewalk in front of the studio entrance. She stood there for a minute and even from where I was I could see the disappointment on her face. Then she saw me. Miss Allen had a moment of indecision, but pride won out. She turned and began walking away in the opposite direction. I cursed all stubborn people and drove up alongside her. Through the open window, I said, "Hello again, Miss Allen. May I give you another lift?" She stopped, looked at me, and began to shake her head, but her face crumpled into tears. I got out and put what I hoped was a comforting arm around her shoulder. She leaned toward me and I heard a quiet voice say, "Oh, Mister Spicer . . . . "
"I know, kiddo, I know. Come on, let's see what we can do about this situation." Miss Allen allowed me to help her into the car. Once she was seated, I stowed her in back and climbed onto the driver's seat. There, I thought the about easiest way to get my inherited redheaded pest pointed back to Denver, Colorado. "Constance, do you have a return ticket to Denver?" The tears on her cheeks made it difficult for me to take what she said seriously. "What on earth for? Why would I want to go home?" This girl was impossible. Patiently, I said, "All right, let's back up a little here. They wouldn't let you onto the studio lot, right?" She nodded. "They said Mister James Stewart was not at the studio." "That sounds like the truth. Stewart is a contract player at MGM down in Culver City. He would have no reason to be here." "He did too! Look there." Constance was pointing to one of the large billboards attached to Columbia's wall. 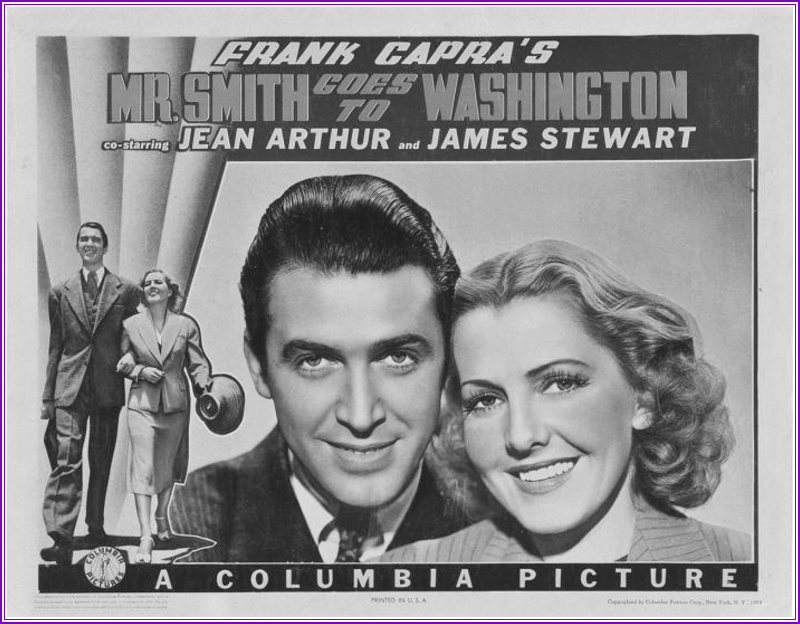 The one she pointed to advertised Mister Smith Goes To Washington staring Jean Arthur and James Stewart. Below that, the sign clearly said, "A Columbia Picture." By golly, she was right. Stewart actually was here not too long ago. I said, "So he did. Apparently MGM loaned him out to Columbia." Sounding a little more cheerful, she said, "Do you know where MGM is? Will you please take me there?" "MGM's lot is down in Culver City, about ten miles from here, but Stewart is not likely to be there this late in the afternoon. Tell me something, Constance." She looked at me. "What, Johnny?" "What makes you so sure Jimmy Stewart is expecting to see you?" Constance looked at me like I was a dumb kid. "Why, the letter he sent me, of course." "Jimmy Stewart sent you a letter?" "Certainly. I would not come all this way without an invitation!" I sat back in the driver's seat. "And how did he come to send you this invitation?" 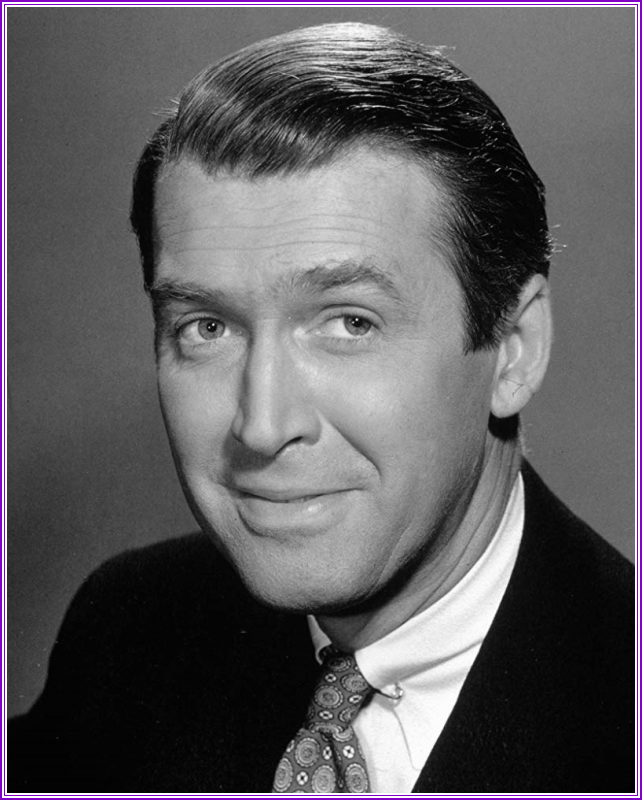 "My Aunt Mary went to school with Mister James Stewart when she grew up in Pennsylvania. She wrote Mister James Stewart a letter to tell him I was learning to be an actress and praised me to the heavens. She asked him to send me a letter of advice and he did." I was thinking about what a wise man once said about making assumptions. For a smart detective, I wasn't doing so well. To avoid further stupidity, I asked for more facts. "What did he say in the letter he sent you?" "Mister James Stewart said he would be happy to give me any advice and help he could, and I should come to California so we could discuss my career in person." "That's a rather expensive trip to make for a chat." She smiled what a movie script would probably call a knowing smile. "My family is . . . I guess you'd say, 'well off.' Now, how do you suggest we find Mister James Stewart? That is, if you are willing to help me." I sighed. "Miss Allen, I'm afraid I sold you short. I had the idea you were just another kid with a head full of dreams about being a movie star. Let's begin by going to my office and making use of the telephone." When I opened the door to my office, Constance read the words painted on the frosted glass. "'Jonathon A. Spicer Investigation Agency.' Goodness! Are you a real detective?" "Not so as anyone could tell by my behavior today. Have a seat while I try to improve my batting average by detecting the whereabouts of Mister James Stewart." It didn't take long to find out that Stewart's agent was Lew Wasserman. I called Wasserman's office and got through to his private secretary. I explained the situation, mentioning Constance Allen by name. She gave my story the benefit of the doubt and said she would pass it along to her boss and promised I would hear from her or Mister Wasserman within an hour. Constance was smiling when I finished my call to Wasserman's office. I told her the gist of the conversation and her smile got bigger. "I knew you could do it!" The telephone rang no more than twenty minutes later. I picked it up and a familiar voice I'd never heard in person before said, "This is Jimmy Stewart, Mister Spicer. Ahhh . . . I . . . I understand I can reach Miss Constance Allen at this number. May I please speak with her?" I said, "You may," and handed the telephone handset to Constance. I got up and stared out the window at the traffic on Highland Boulevard two floors below while she had a conversation with Mister James Stewart. Half an hour later my office door opened and a fellow in a dark suit walked in. He said, "Mister Stewart is here to pick up Miss Allen." Constance stood up, pointed toward her bag, and said she would be right down. The driver took off with her bag and she turned to face me. "Johnny . . . I hope it's all right if I call you Johnny." 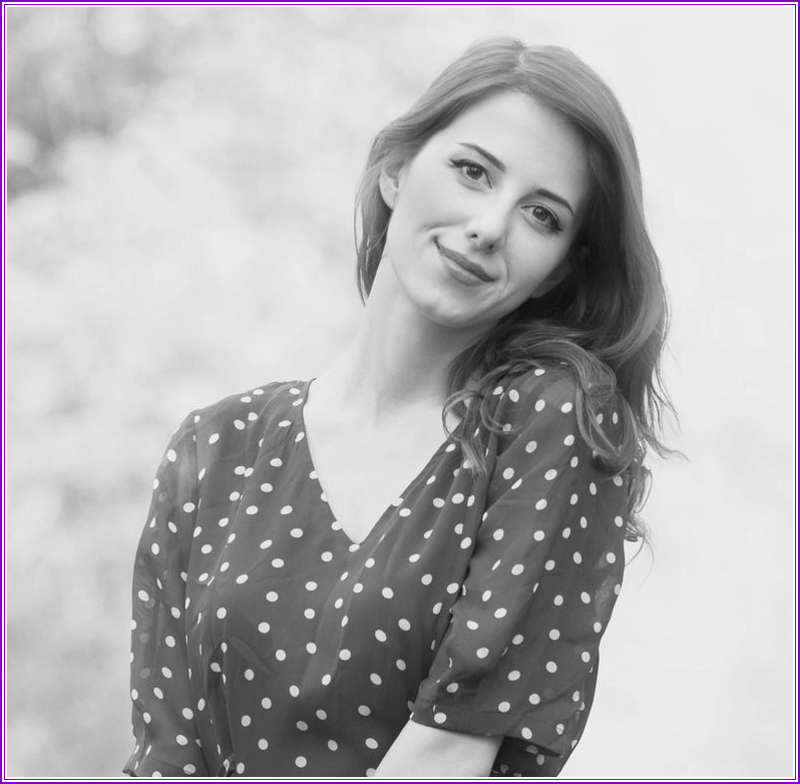 I nodded and she continued, "I really cannot tell you how grateful I am for your help, especially after I was so rude to you when we first met. Thank you for all you've done." "You're welcome, Constance, and I wish you the very best in your film career. Drop me a line when you find the time and let me know how you're doing." "Oh, I will, Johnny. You can count on that." Then I got a surprise. She stood on tiptoe for a second and kissed me on the cheek. After that, she ran out of the office as if she had just committed a mortal sin. On the other hand, if kissing a dumb Hollywood private eye isn't a mortal sin, it probably should be. A moment later I was standing at the window overlooking Highland Avenue. There was a block-long black Cadillac down there, and when the driver saw Constance leave the building, he opened the driver-side passenger door and a tall angular fellow in a dark suit unfolded himself from the rear seat. I'd seen the Cadillac's passenger countless times on the screens of Hollywood's motion picture palaces. He greeted Constance, they shook hands, and moved toward the Cadillac. Before she got in, though, Constance turned back and looked up at my window. She gave me a smile and a wave. I returned her wave and she disappeared into the Caddy. Later, I finally got to my celebration. Leaning back in my desk chair, I raised a water glass of White Horse Scotch from my bottom desk drawer. "Here's to you, Miss Constance Allen," I said aloud. "May you conquer the rest of Hollywood as easily as she conquered this know-it-all shamus." 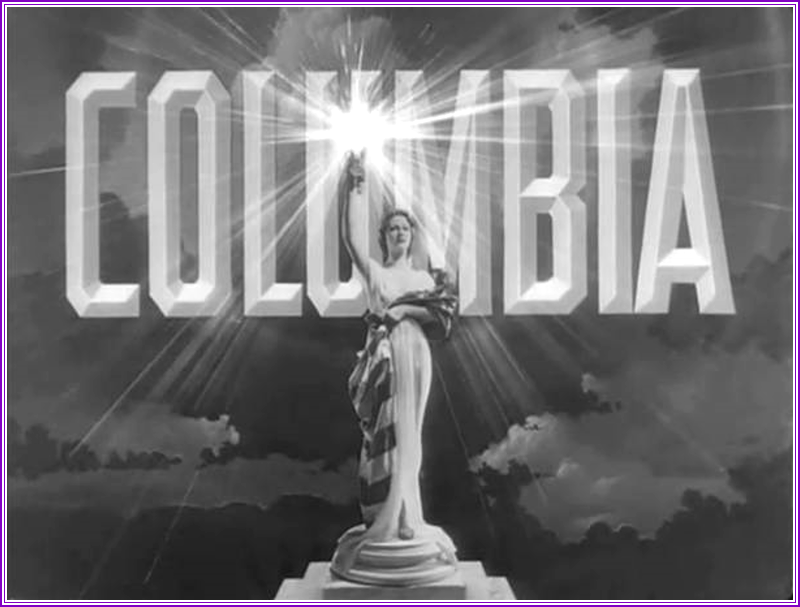 Columbia Pictures title card © Sony Entertainment, Inc.